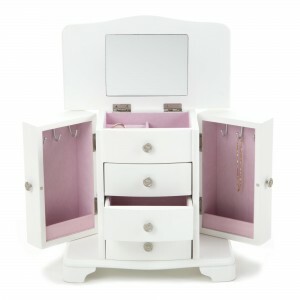 We’ve explored most of the types of jewelry boxes by shape, size & features and most of the types of jewelry boxes by use & styles and now we’re left with the more creative and unusual ones – even some that double as other types of jewelry displays. Universal jewelry boxes are usually meant to package items individually. They resemble individual storage boxes in many ways, the main difference being the fact that for universal boxes, the inside is kept as a simple compartment. This makes them adequate for storing all types of jewelry, unlike specialized boxes. They are usually made of paper or plastic, in order to keep them light and inexpensive, and the inside is lined with soft fabric, for protection purposes. Valet boxes are basically jewelry boxes for men. However, since a wide variety of jewelry that men can wear doesn’t exist, the use of valet boxes has been extended to storing, alongside watches, cufflinks and rings, even keys, writing instruments, memory cards, USB drives and even loose change. Basically, everything that can be easily misplaced. Most valet boxes have many compartments, which help to better organize the various things one might choose to store inside them. Some of them come with trays and mirrors on the inside of the lid, which tends to be hinged. To make them look manlier, they are usually covered in black or brown leather. 2-door jewelry boxes are pretty self-explanatory: they have two doors instead of a hinged top, usually situated in the front of the box. What advantage does this give over hinged top boxes? Well, it means that items are more visible and accessible inside. For classic boxes, you have to open the lid and the trays separately, which doesn’t really give you an overall perspective of your collection. For others, you have to remove the top tray, which can be a drag. But with 2 door boxes, you open the doors and your whole collection is there, in plain sight. This also means that these boxes are usually bigger, making the 2 door system essential for amplifying visibility and accessibility. For some boxes in this category, the doors are located on the sides of the box. Inside, they contain hooks for necklaces and other storage solutions, acting as side compartments, rather than as doors. These are meant for the individual storing of collarettes. The main material for them is cardboard or plastic, helping them to stay light. Inside, they have pad inserts that are made of cardboard covered in soft fabric, such as velvet, to protect and keep the jewelry in place. They are usually larger and square, but slimmer, since collarettes don’t take up that much space. On the market, there are many colors available. Jewelry chests are one of the traditional types of jewelry boxes. Usually made out of heavy weight wood, they can be quite cumbersome, but aesthetically pleasing overall. 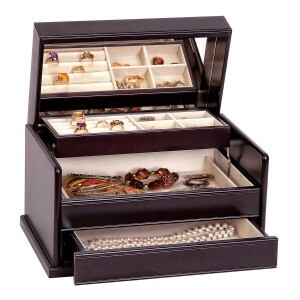 They fall into the category of huge jewelry boxes, as they contain many types of compartments and trays. Some of the smaller ones can be placed on top of dressers, while the truly large ones can either sit directly on the floor or they have a stand to sit on. 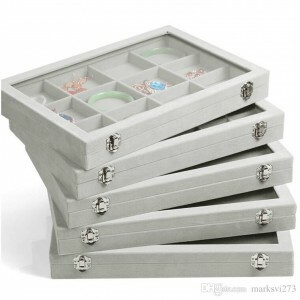 Tray jewelry boxes can come as one or more stackable trays. Their layout includes multiple square or rectangular compartments, which helps to better organize the jewelry. Some include specialized compartments with slots for rings or hooks for necklaces. Most of them come with hinged tops and for some of them, the lid is made of glass. Shadow boxes have a very modern look: they are made almost entirely out of glass, the only other materials used being narrow metal frames and velvet inserts at the bottom. They usually have a single compartment and that can make organizing your jewelry tricky. However, if you plan to store only a few pieces or all your pieces of the same type, then these boxes would suit your needs, especially if you find that they also fit in nicely with your space. Jewelry caskets are the smaller version of jewelry chests. They tend to resemble keepsake boxes in shape and size, the main difference between them being that while keepsake boxes are usually made of wood, the more common materials for jewelry caskets are metal and glass. As opposed to keepsake boxes, which are kept very simple on the inside, these generally contain soft fabric inserts, to protect both the inside of the box and the jewelry itself. Since they are mostly made of metal and glass, both materials that can be melted and molded relatively easily, they come in shapes that are typically more sophisticated, when compared to keepsake boxes. Pillow jewelry boxes are generally used to package items of jewelry that are offered as gifts. As their name would suggest, they are shaped like pillows. They are made of cardboard or paper, because the way they are fabricated requires them to be made out of pliable material. This also keeps them light and relatively inexpensive. 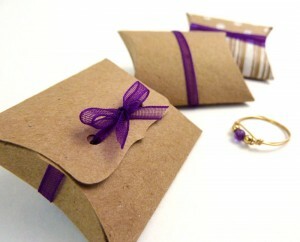 Inside, they contain a separate piece of cardboard on which the jewelry can be kept in place. Some of them, however, have some sort of system to prevent the jewelry from moving on the lid, for example. They have simple designs, usually being monochromatic and with a colorful satin ribbon on the outside. 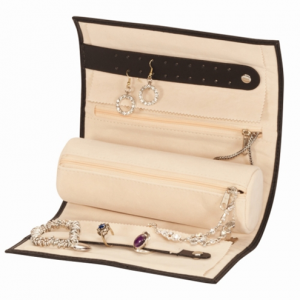 Jewelry pouches are an adequate alternative to boxes for people who want to save space or they feel like they need a more compact jewelry storage options. Jewelry pouches vary in size, with some that are meant for individual storage and some that could store a decent amount of pieces. However, only some of them have compartments inside, which means that with jewelry pouches, it can be harder to organize a collection. There are various designs on the market, a very practical feature of their design being the closing system. The two most common are with drawstring and with buttons. Jewelry rolls are pouches of fabric or leather that lay flat when you open them. Depending on their size, they can have quite a lot of various types of pockets in which to store your jewelry. To hold everything tight and secure, you roll the pouch into a cylinder and you secure it with a band or some other closing system that comes with the roll. These are a very practical and definitely less cumbersome way to pack jewelry on travels, compared to travel cases. The fact that they are made of fabric makes them more pliable, compact and lighter, so you can easily sneak them in any free space you have left in your luggage. Jewelry rolls are a great solution for everyone who tends to pack more than they should for their trips, but still want to be able to carry a decent amount of jewelry. With this much variety, it can all feel like a bit too much. However, variety shouldn’t turn us away when looking for a jewelry box: it means we have all the more chances of finding one that fits our needs just right. Your jewelry box can be more than just a place to store and protect your jewelry items: it can be a subtle way of self-expression.